It's a great design for a new quilter to try. I get all my students trying pebbling in their first class. Pebbling introduces you to a couple of important concepts: the idea that you can travel along a line you've already stitched to get somewhere else, and how to go about filling in an open space. And the payoff for that is a texture that delights both eye and hand. I pet my pebbling a lot when I stitch some. It just feels soooooo fabulous. 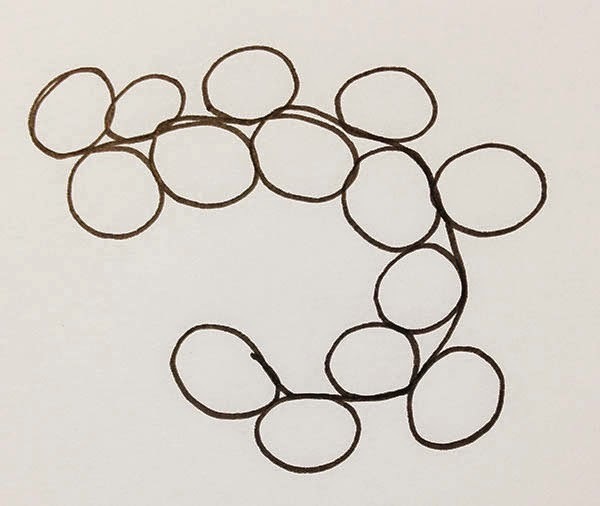 So the secret about pebbling is: it is just circles. 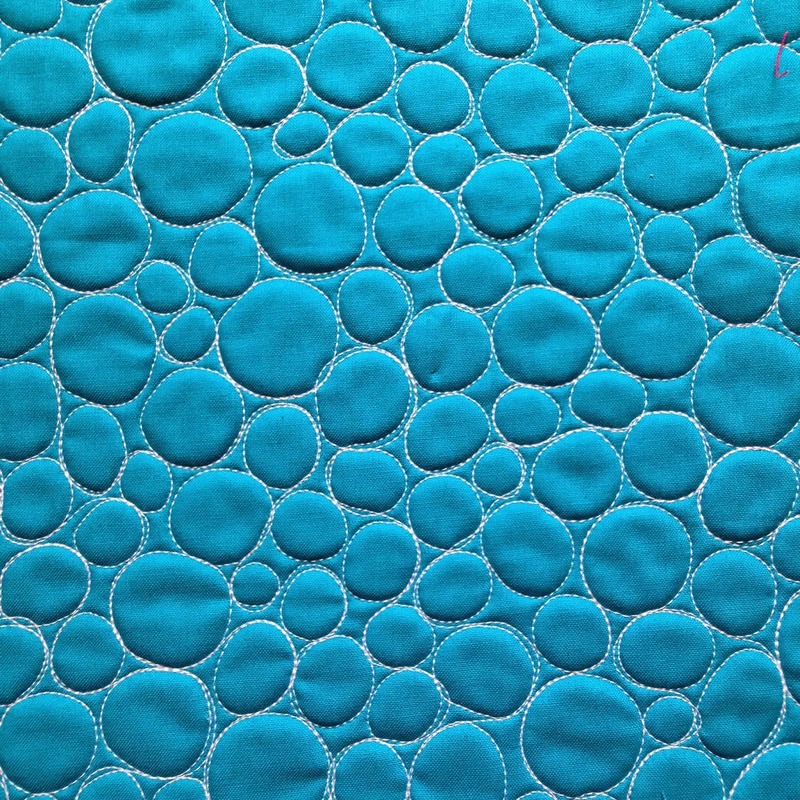 All you have to do is quilt a roundish shape and then do that over and over, with a little bit of traveling along what you've already stitched to let that happen. b. Continue your motion to make another circle. c. Now you are trapped between two circles. To get out, travel around the circle you just made until you have enough space to start a new pebble. If you have never done pebbling before, here is a video of me stitching it. There are some things I want you to notice if you watch it. My pebbles alternate in the direction I stitch them. One goes clockwise, the next counterclockwise, then clockwise again. This allows me to keep stitching in a smooth flow, almost a figure 8 feel to the motion. I never have to stop and switch directions. It's very fluid once you get the feel for it. I vary the size of my pebbles. I can't keep my pebbles all the same size, and I don't try to. 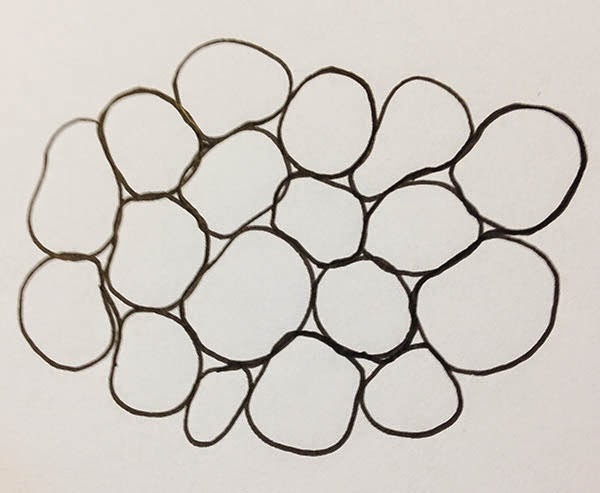 When 3 or 4 pebbles come together there are little spaces between them. I leave those unfilled as long as they are smaller than my smallest pebble. I get to decide what my smallest pebble will be. And so do you! 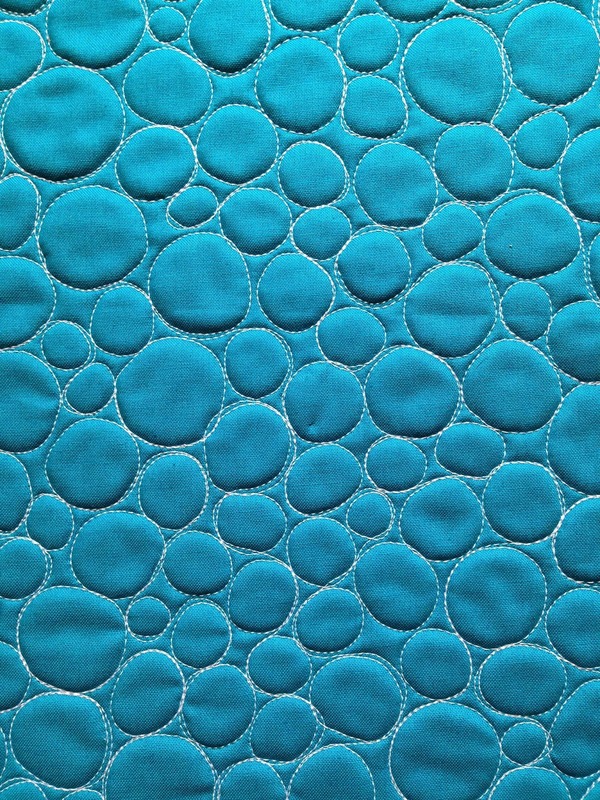 To fill the space I let my pebbles "flow" around the perimeter I've already quilted. I am slowly building up layers as I go, moving back and forth as I wish. That's not how you have to do it, but for some quilters that guidance helps them know where to go next. You're never stuck with pebbling. You can always sneak through the area you've quilted to get somewhere else. After you've seen me stitching it I suggest you try sketching it. Work out some of the kinks on paper and when it starts to feel a little familiar then move to your practice quilt sandwich. Not completing the circle (above): Your pebbles are touching other pebbles. That's good! Touching another pebble is not where you stop your pebble though. Make sure you are completing the circle all the way back to where you started it before going on to the next pebble. Chains (above): You are completing your circle and then starting a new circle in the opposite direction, that's great! Now let yourself flow around the outside of the area you've already stitched, rather than extending a long path of pebbles into space. That means sometimes you will travel farther around a completed pebble to get to the other side of it before you start your next pebble. Flowing around your quilted area keeps you from having big empty pockets that didn't get quilted. 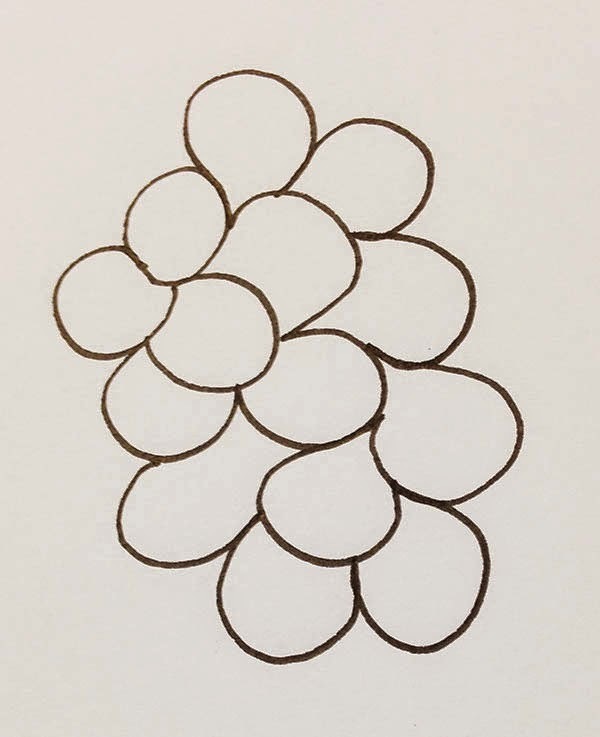 Blobs (above): You're completing your pebbles and they are touching other pebbles. Great job filling in the space! They are a little smooshed together instead of round, they share long sides instead of just touching at a point. That's totally fine and you can keep doing it just this way if you want, it still looks great! If you're not satisfied with how it looks though, and want it to look more like my sample, pay attention to keeping your pebbles round. Once you start your pebble just let it be its own shape. New pebbles and old pebbles just need to touch at a point, no more than that. I hope this is helpful to some of you! I love seeing pebbling "click" for people in my classes. It's definitely worth spending time with this design until it clicks for you. Great tutorial, as always, Christina! Thanks for the video! My pebbles are not as round as yours (good job!) but I am happy with them. I love the idea of "sneaking through" an area to get to another point. I am adding that to my mental bag of tricks. Great tutorial. I think I'm going to love your book. Now I just have to get myself a FMQ foot for my sewing machine. Any suggestions or recommendations for someone who has no idea what's out there or what to look for? Very helpful Christina. I tried it and did pretty well! A little blobby here and there, but now too bad. I love how thoroughly you've shown us how to go about this. Thank you! LOL - pettable pebbles!